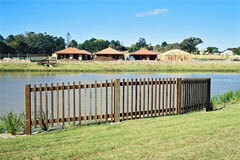 The Baychester range of products is made from durable 125x125 rough sawn hardwood. It has a tapered top, pencil rounded corners and a single groove. Treatment with Tanalith E (Copper Azole) (Chrome & Arsenic free) is done after all fabrication. Customised product can easily be accommodated. 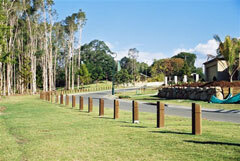 Bollards are available in standard lengths of 1.2, 1.35, 1.5 and 1.8 metres. Normal depth in ground is 0.6m. Some 1.2m bollards are normally stocked. Galvanized Bases for lift-out bollards are available. “Baychester” bollards › (120 KB PDF brochure). Specify: Outdoor Structures Australia Baychester12, Outdoor Structures Australia Baychester1350, Outdoor Structures Australia Baychester15, Outdoor Structures Australia Baychester18. Matching fencing is available based on the 1.8m bollard in conjunction with Outdoor Structures Australia’s Vertical Handrail VR145/44. You can specify the number of rails and spacing. See suggested one and two rail arrangement (160KB PDF). Dressed pencil rounded balustrade can be supplied to your requirements. Refer to table of Standard Green Off Saw sizes - use unseasoned dressed column. 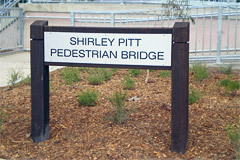 Signage is available to match the bollards and fencing. They are custom made to suit your signage requirements. 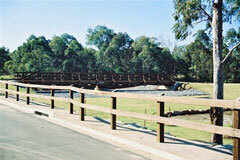 Specify: Outdoor Structures Australia Baychester Sign, actual sign dimensions (nominate) high, (nominate) wide.